Wired, the new album from flautist, piper, and composer Michael McGoldrick, is more than just the long-awaited follow-up to his groundbreaking 2000 album Fused. It is the culmination of musical pursuits first hinted at by his formative days in Manchester – pursuits that have defined him as one of the most vital and inventive musicians in today’s British Isles folk renaissance. On any of his chosen wind instruments (he commands a small army of flutes, pipes, and whistles), McGoldrick combines peerless technique with a musically rich sense of dynamics and texture. These sensibilities – equally apparent in his performances, compositions, and arrangements – add depth and power to whatever project he contributes to. Further, they insure that the traditions that are the bedrock of his art remain simultaneously timeless and strikingly immediate. Wired, released in January 2006 by Compass Records, is the ultimate example of his open-ended approach, with McGoldrick’s fluid, soulful performances and compositions seamlessly melded with a startling variety of rhythmic backdrops. From spacious jazz trappings to surging Indian percussion, electronic loops to bluegrass banjo, Wired brilliantly harnesses the rhythmic momentum of Celtic folk music while bravely pushing into new sonic realms. A co-founder of best-selling Irish instrumental outfit Lunasa and current member of Celtic favorites Capercaillie, Michael McGoldrick has played a great part in expanding the audience for British Isles instrumental music. The relationship between Irish traditional music and more contemporary forms is something he has explored since the earliest days of his musical career. Born to Irish parents in the British city of Manchester, he was swept up in the city’s active Irish music scene as a youth. At the age of 15 he traded his bodhran for flutes and whistles, and proceeded to win several prestigious All-Ireland Championships. While still in school he founded the popular and influential Celtic-Rock band Toss the Feathers, with whom he first came to international prominence. His 1995 duet album with Toss the Feathers’ fiddler Dezi Donnelly, Champions of the North, won BBC Radio Two’s Young Tradition Award, making him the first wind player to receive the honor. The ambitious fusion that characterized Toss the Features combined with McGoldrick’s proven abilities in traditional forms soon made him much in demand as a session player in a variety of musical contexts. He was featured alongside Youssou N’Dour and John Cale on Alan Stivell’s 1998 album 1 Douar, and also contributed flutes and whistles to the first two albums by British folk sensation Kate Rusby. In 1999 he appeared on the Afro-Celt Sound System’s album Volume Two – Release, in addition to Karan Casey’s Seal Maiden. 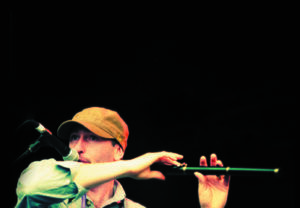 In 1998, McGoldrick was asked to join the popular Scottish folk band Capercaillie, an invitation he accepted. Working on several albums with Capercaillie developed his rapport with producer, arranger, and keyboardist Donald Shaw. Shaw, who in addition to Capercaillie’s albums has produced projects by Karan Casey and Karen Matheson, and McGoldrick collaborated extensively on McGoldrick’s 2000 solo debut album Fused. It became an instant favorite thanks to its daring combination of Irish traditional forms with trance and electronica beats and textures. Following the release of Fused, McGoldrick continued to pursue more eclectic concepts with Capercaillie and in his session work, while maintaining his reputation as a fine traditional player with the albums First Light (a 2002 collaboration with fellow flautist John McSherry) and Tunes, a 2005 release featuring McGoldrick alongside Irish accordion ace Sharon Shannon, fiddler Frankie Gavin, and guitarist Jim Murray. The result of three years of focused composition, recording, arranging, and sonic experimentation, Wired takes the many threads that define McGoldrick’s music and splices and re-connects them in intriguing new ways. The ingenious electronic element captured on Fused is still palpable, but now expertly intertwined with an even wider range of organic sounds from around the globe. A British Council trip in 2004 allowed McGoldrick to collaborate with musicians from Bangla Desh, inspiring him to include slithering tabla as one of Wired’s most distinctive rhythmic components. Opener “Wired to the Moon” features a loping 5/4 groove, haunting electric guitar, throbbing tabla, smoky brass, and a supple funk backbeat all supporting McGoldrick’s immediately recognizable flute and (as the track unfolds) pipes. It serves as an overture to the album as a whole, hinting at the themes and textures that will be explored in further detail throughout. Joining McGoldrick on his explorations are old Toss the Feathers mate Dezi Donnelly on fiddle, producer Donald Shaw handling keyboards and programming, veteran bassist Ewen Vernal, tabla master Parvinder Bharat, trumpeter Neil Yates, and Shooglenifty’s James Mackintosh on drums, among others. World-renowned fiddler and producer John McCusker (Kate Rusby, Cathie Ryan) and Grammy™-winning newgrass banjo player Alison Brown also enliven the proceedings on select tracks. Wired has met with instant critical acclaim in the UK. In a five-star review in the Sunday Herald, writer Sue Wilson proclaimed, “If there’s any justice, Wired should be up for next year’s Mercury Prize.” While the mix of styles and vibrations encompassed by Wired is indeed refreshing and astonishing, it is not surprising that music so exciting and inventive has emerged from the visionary imagination of Michael McGoldrick.